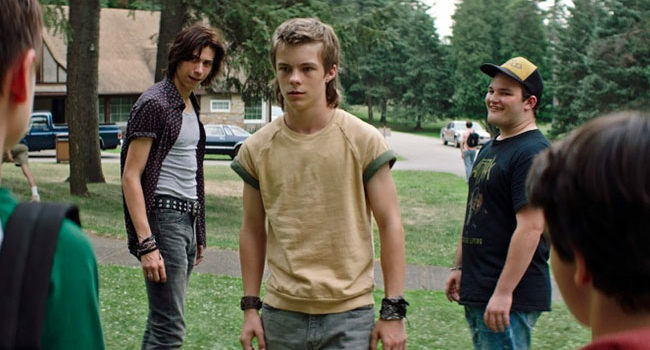 In Stephen King’s It (2017), Henry Bowers (Nicholas Hamilton) is the leader of the Bowers Gang who, along with Patrick Hockstetter, live to bully kids like Ben Hanscom and Richie Tozier from the Losers’ Club. Roll up your shirt cuffs and wrap a bandana around your wrist to complete the Bowers look. In Stephen King’s It, Patrick Hockstetter (Owen Teague) is a disturbed teen who bullies the Losers Club. He cheers on Henry Bowers as he tries to carve his name into Ben Hanscom’s belly. Ben escapes, and Patrick goes into the sewers looking for him, only to find Pennywise instead. In Stephen King’s It, Georgie Denbrough (Jackson Robert Scott) is the younger brother of Bill Denbrough. He is playing with a paper boat one rainy evening when it winds up sailing into a sewer drain. Thankfully Pennywise the Dancing Clown is there to help him retrieve it. In Stephen King’s It (2017), Beverly Marsh (Sophia Lillis) is the only female member of the Losers Club. Coming from poverty and as a survivor of abuse, Bev forms strong bonds with other members including Ben Hanscom, Eddie Kaspbrak, Bill Denbrough, and Richie Tozier. Her olive drab overalls are tough to find, but these will do the trick once you convert them from longs to shorts. In Stephen King’s It, Bill Denbrough (Jaeden Lieberher) is the leader of the Losers Club. Having lost his younger brother Georgie to Pennywise already, he vows revenge on the monster, with the help of Eddie Kaspbrak, Richie Tozier, Bev Marsh, and Ben Hanscom. In Stephen King’s It, Ben Hanscom (Jeremy Ray Taylor) is a member of the Losers Club due to being overweight and bullied at school. He counts among his friends Richie Tozier, Beverly Marsh, and Eddie Kaspbrak. In Stephen King’s It, Eddie Kaspbrak (Jack Dylan Grazer) is a sickly hypochondriac boy, though his broken arm is quite real. He might get that from his domineering mother, who is constantly worrying about his health. He only truly feels well when he’s with this friends in the Losers Club, including the likes of Richie Tozier, and Bev Marsh. In Stephen King’s It (2017), Richie Tozier (Finn Wolfhard) has the nickname Trashmouth Tozier, so you know he has a loud mouth and loves foul language. He’s the clown of the Losers Club. No, not literally the clown, that’s a fella named Pennywise. In the 2017 remake of It, Pennywise the Dancing Clown (Bill Skarsgard) is an ancient, trans-dimensional evil spirit that takes the scariest form of all — a creepy killer clown. Compared to the 1990 adaption of Pennywise, this one is lankier and childish but creepy as hell all the same. While wearing the clown costume, roll around in the dirt to give it the right weathered look.